This is an extreme angle look at the southeast corner of City Hall in Hampton, Virginia. 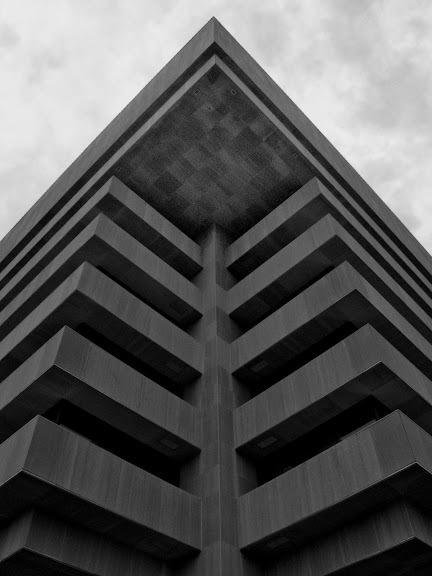 The 1976 modern stone building is a striking architectural landmark in one of the country's oldest cities dating 1610. The unique design creates many more prime "corner offices" with great views of the harbor and downtown. Canon G10, 1/500 sec @ f/8.0, ISO 200, 11mm equivalent focal length, converted to black and white using Silver Efex Pro plug-in in Photoshop Elements.